The CO2 uptake capacity and CO2/N2 selectivity of Tröger’s base–bridged nanoporous covalent organic polymers (TB-COPs) were investigated. TB-COPs were synthesized by reacting amine terminals of tetrahedral monomers - namely, tetraanilyladamantane and tetraanilylmethane - with dimethoxymethane in a one–pot reaction under relatively mild conditions. Interestingly, these two tetrahedral monomers formed nanoporous polymers with substantially different surface areas. While the trögerization of tetraanilyladamantane monomer (TB-COP-1) exhibit high surface area of 1340 m2 g-1, that of tetraanilylmethane monomer (TB-COP-2) is found to be only 0.094 m2 g-1. This unusual phenomenon can be explained by the proximity of amino moieties to each other within the monomeric unit. 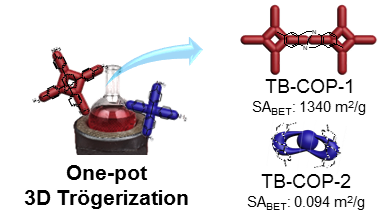 Shorter distance between the amino groups enables intramolecular cyclization along with the intermolecular one, thus resulting in much lower porosity. TB-COP-1 exhibits significant CO2 uptakes up to 5.19 and 3.16 mmol g-1 at 273 and 298K under ambient pressure, and CO2/N2 selectivities of 79.2 and 68.9 at 273 and 298K at 1 bar for the gas mixture of CO2:N2 in the ratio of 0.15:0.85. It is noteworthy that TB-COP-1 showed remarkable selectivity retention with rising temperature from 273 to 298 K.